It is also acceptable to link to this page on other websites and in emails using the title above and the following URL: http://internet4classrooms.com/printables/common_core/math_mathematics_6th_sixth_grade/description_download_30900-CCSS.Math.Content.6.NS.A.1.htm or simply: http://i4c.xyz/y89u4qjf. The answer key corresponding to this worksheet may be found here: http://i4c.xyz/ycju6fp4. Problem Type: Divide Improper Fraction by Improper Fractions. 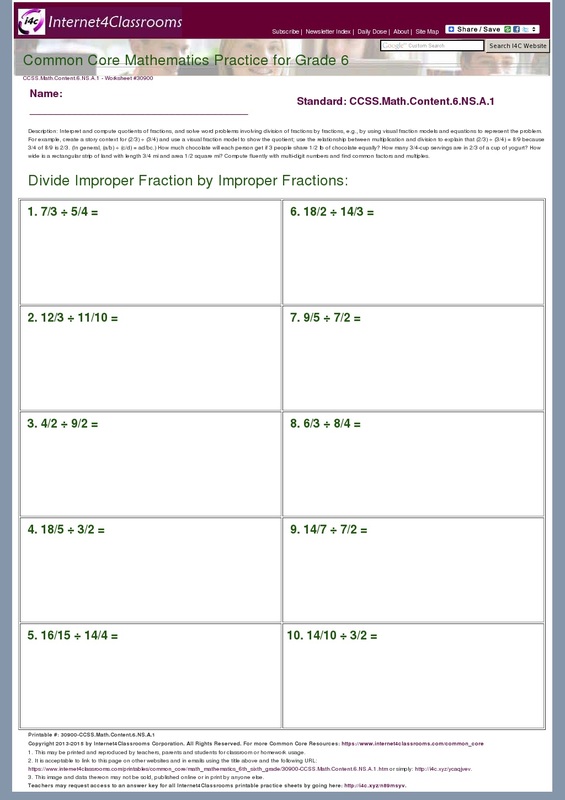 Interpret and compute quotients of fractions, and solve word problems involving division of fractions by fractions, e.g., by using visual fraction models and equations to represent the problem. For example, create a story context for (2/3) ÷ (3/4) and use a visual fraction model to show the quotient; use the relationship between multiplication and division to explain that (2/3) ÷ (3/4) = 8/9 because 3/4 of 8/9 is 2/3. (In general, (a/b) ÷ (c/d) = ad/bc.) How much chocolate will each person get if 3 people share 1/2 lb of chocolate equally? How many 3/4-cup servings are in 2/3 of a cup of yogurt? How wide is a rectangular strip of land with length 3/4 mi and area 1/2 square mi? Compute fluently with multi-digit numbers and find common factors and multiples.